Christmas Music Wreath Ornament - Lovely Etc. So today is the twelfth and final day of sharing handmade Christmas ornaments! I’m pretty sure this last ornament may just be my favorite of the Twelve. 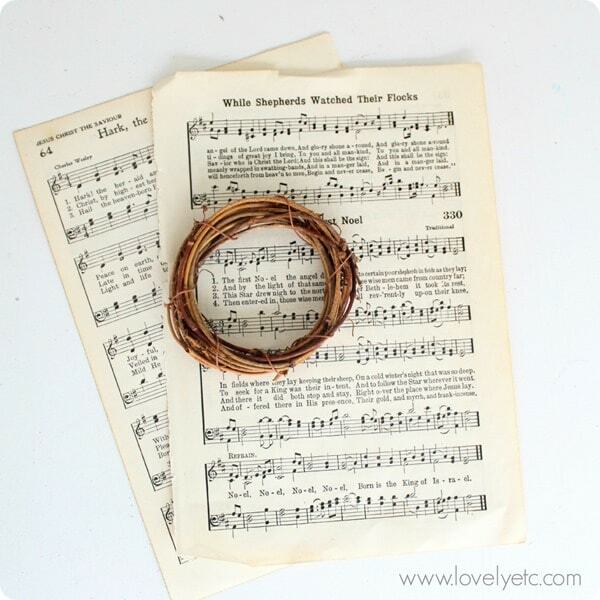 I made this tiny Christmas music wreath using pages of Christmas carols torn from an old hymnal. Around here, hymnals are pretty easy to find at estate sales and thrift stores but if you don’t have time to go searching for your own, I’ve got you covered. 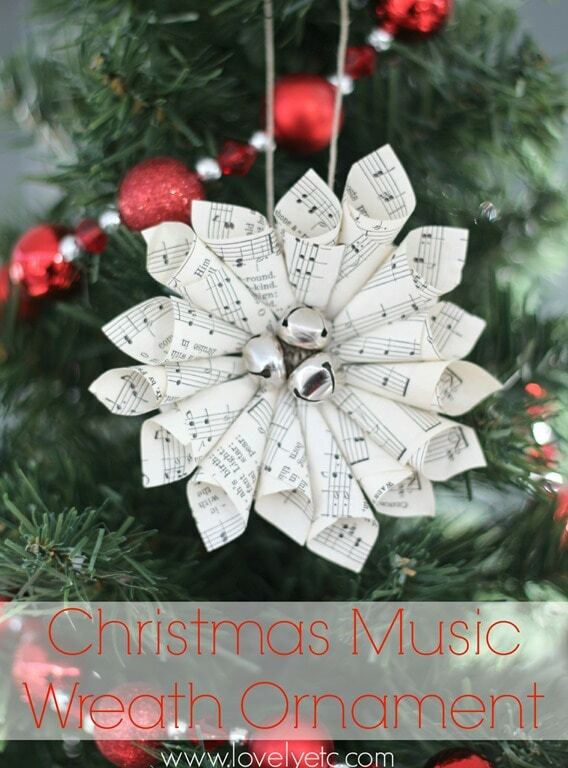 Yesterday I shared a free download of three of my favorite Christmas carols straight from my vintage hymnals – Silent Night, O Little Town of Bethlehem, and Joy to the World. You can download your own copies, print them out, and you are all set. Just make sure to print them on both sides of your paper for this project. To make this wreath, I used pretty much the same method I used for my salvaged Bible wreath – just much smaller and with more layers. 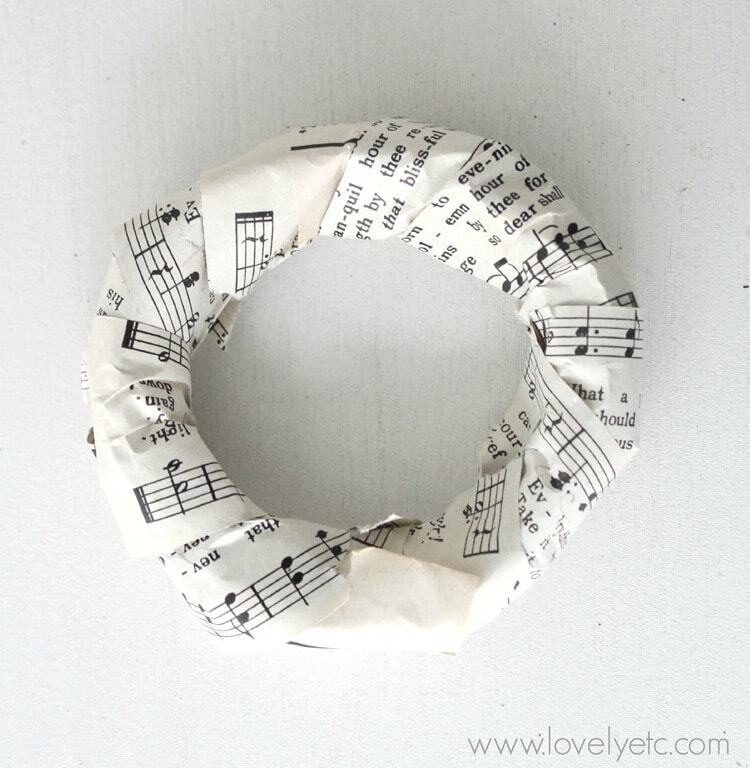 First cut a few long strips from your music and cover your little wreath. This will be your base. Cut the rest of your music into tiny rectangles – around two inches by three inches. Roll each rectangle into a cone and hot glue it together. Hot glue the cones onto the tiny wreath form. Tie three jingle bells together with a piece of twine or string. Push the twine through the hole in the center of the wreath. You can glue it in place or just tie the ends of the twine around the wreath form. Finally, tie another piece of twine around the wreath base for hanging. If you missed any of the 12 days of Christmas, you are going to want to be sure to catch up on all of the handmade Christmas goodness here. Thank you so much Chris! I love the jingle bells too. I never thought to put them in my hair but I may just do it sometime this year. I do love the sound of jingle bells! I love this! And it actually looks easy enough for me to do! 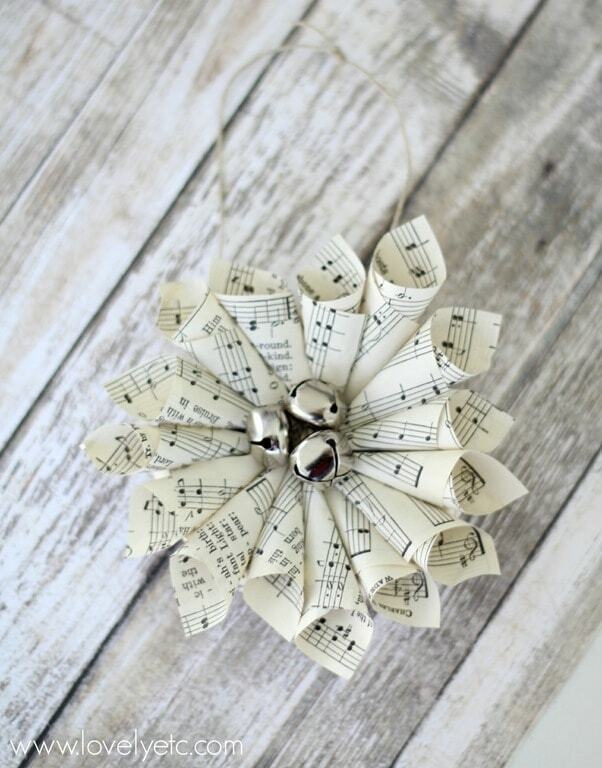 My husband was a music major in college and I would love to make him a few of these for the tree. Our family is all about “Special” ornaments that have meaning to our lives. So these are perfect. Thanks again for sharing! Thanks Melissa! 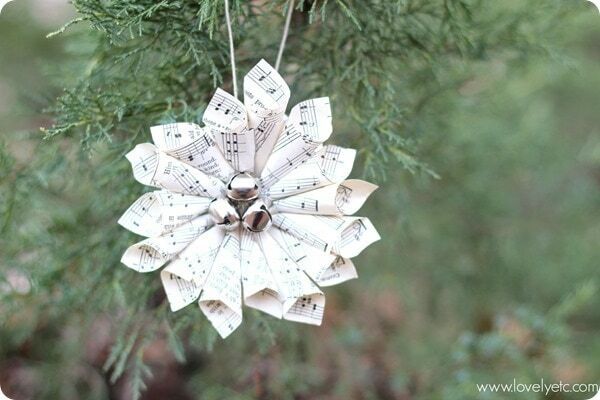 I’m a big fan of meaningful ornaments too and this is definitely a perfect ornament for any music lover! Carrie, I started making one of these ornaments. 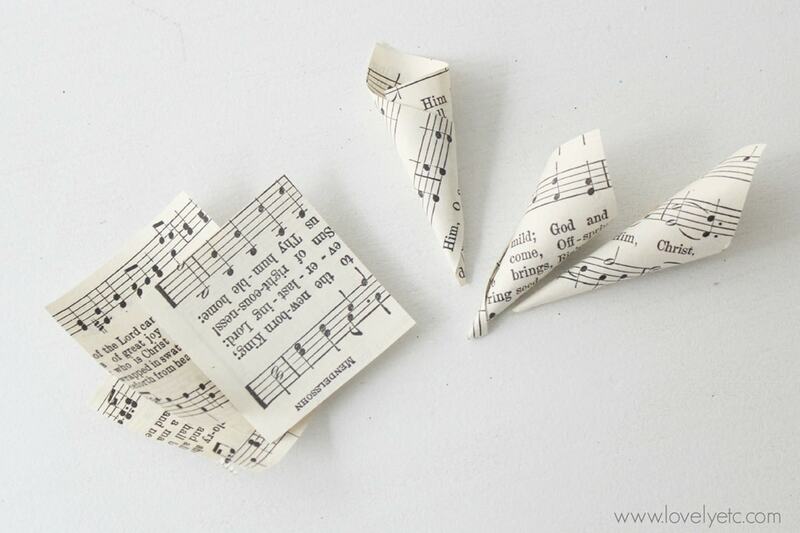 That is, I glued about 6 paper music cones and stopped. Thanks to you I have a better idea of what to do. I will get a wreath and some small bells — definitely the bells. Thanks for sharing. I saw your link at Inspire Me Monday party. Thanks Ann Marie! Glad I could help! 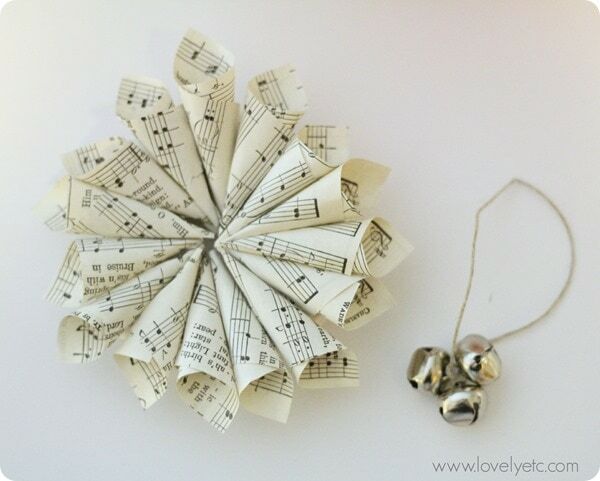 The wreath definitely makes it easier and the little bells just add the finishing touch!